Pain- Free, Hair- Free is a state-of-the-art procedure specially designed to remove unwanted hair faster, more comfortably, and with fewer visits than ever before. Now, because of the patented IN- Motion technology of Pain-free, Hair – Free, you can ever treat sensitive areas without the discomfort of other systems. By using a sweeping, paintbrush technique, the Pain-free, Hair- Free procedure is shorter, more comfortable and gives great results. The IN- Motion technology gradually heats the hair follicles under the skin until they can no longer produce new hair. Since the laser is in constant motion, your treatment area can be wider- which make sessions go quickly. In additional, a patented DualChill mechanism ensures the surface of your skin stays cool and comfortable throughout your treatment. The Pain-Free, Hair- free treatment is suitable for all skin types, including tanned skin. You can expect results from a series of relatively short sessions. Virtually pain- free with no medication or other pre-treatments required. Quick—treatments are usually under an hour. Recovery-free, so you can return to normal activities immediately. Effective for all skin types, including tanned skin, as well as different hair types. Perfect for any area of the body- including more sensitive areas like the face, neck and bikini area. Hair removal is one of the aesthetic medical industry’s most well-known and researched uses of lasers. Thousands of patients worldwide have enjoyed a life without unwanted hair, thanks to Pain- free, Hair- Free. This is the most sophisticated technology for Hair removal, with no downtime pain and good results for Hair Reduction. We at Skin & You Clinic specialized in this In- Motion technology. 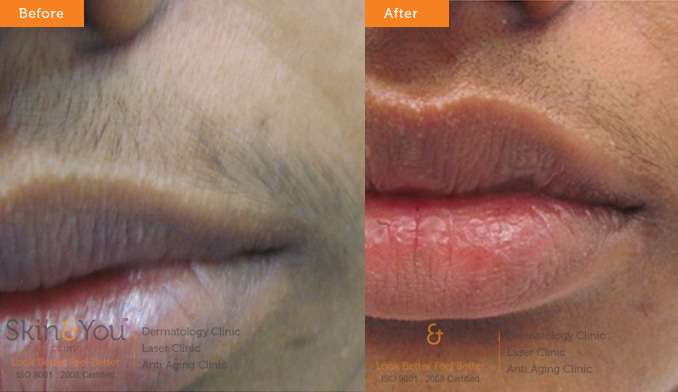 At Skin & You Clinic we understand that patient comfort and result are most important.